Currently, GDC faces the challenge of getting students involved with their membership. Because of the lack of proper communication, students don’t see the value of GDC which results with the majority of students missing out on the benefits that GDC offers. With keeping that issue in mind, our goal (for Sara Lilley and I) for this project was to positively change students’ perception of GDC. 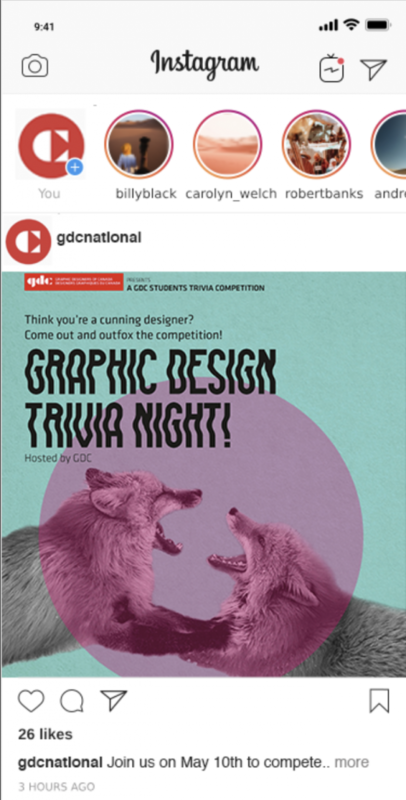 A solution Sarah Lilley and I came up with was to create a nation-wide student trivia night competition based on graphic design knowledge and using a game system like kahoot. In urban areas such as Vancouver and Toronto, a local agency would host the event at a local bar/restaurant where students would get the opportunity to meet other students while in rural areas, students would be able to form their own teams and play through the app. Whether students decide to go to the hosted event or play in the comfort of their own space, they would all be connected through the online game. This event would also allow non-GDC members to play (as long they have 1 GDC member on their team) which would open up the opportunity for them to learn about GDC and understand the value of becoming a member. Our collateral pieces were a poster for print, an event page on the GDC website and an Instagram post. We wanted to create something that was fun and eye catching which is why we decided on a photo collage poster. The combination of photography and graphic overlays really pushes the idea of graphic design. 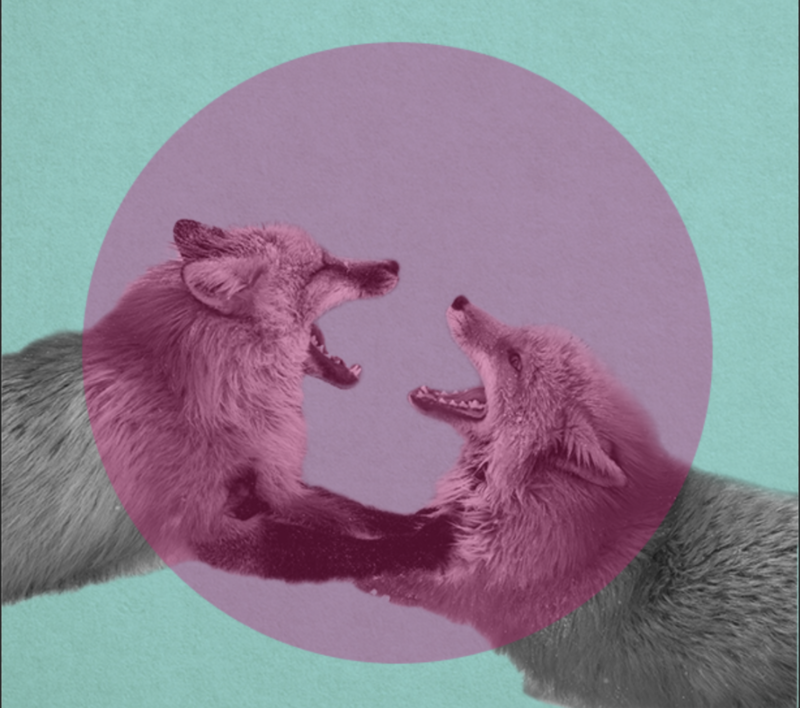 We chose to use foxes because they’re known for their wit and we specifically chose an image of them fighting in order to portray a friendly competition. 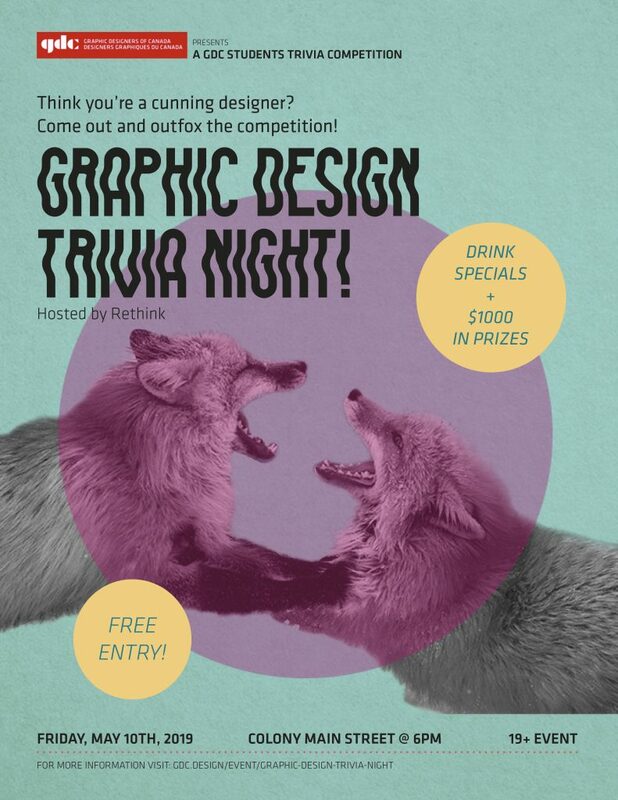 The event would be beneficial because students would be able to meet and socialize with other design students, keep their design knowledge fresh and make them feel like they’re part of a community. I would give our work an 8/10 because I believe we created fun and interesting pieces that would encourage students to attend this event. Throughout this project, Sara Lilley and I worked well together to create the moodboard and create a direction for our idea. I was in charge of the poster and Instagram post. Coming into this project, I learned much more than I had previously been taught before. My group and I came up with many different ideas on how to increase visibility on Indigenous people and highlight their rich culture. This is how we came up with Land of Bannock. Our whole idea behind Land of Bannock was to create a space where the public could learn about Indigenous people (Musqueam, Tsleil-Waututh, and Squamish) in an engaging matter and highlighting their connection to the land that we reside on currently. Instead of having an ordinary food truck, we wanted to create a whole experience. Our solution was to incorporate the 5 senses into Land of Bannock by producing collateral that incorporated it all. We wanted the public to walk away learning something new while enjoying their indigenous food made with authentic Indigenous ingredients. To begin with, the food truck itself would have facts written all over it in order to give people something to read while it’s parked. We decided on a food truck as opposed to an actual shop due to the mobility of it. To support this idea, we created a sandwich board that would state a fact about the area we’d be parked (a local leader or the significance of the land). As mentioned before, our menu would consist of authentic Indigenous cuisine and also be land specific. Our packaging would share more facts on the box along with a land acknowledgment statement. We created icons that would be used as stickers and stamps to match our loyalty card which customers would be able to used to eventually get a free meal. Lastly, we created a microsite for the food truck so people would be able to get additional information once they walk away from the truck. Basically, we wanted their experience to continue even after they had left the presence of the truck. I’m very grateful we got the experience to meet & speak with Michelle and the Indigenous film students as they taught us how easy it is to fall into ignorance, even as well-hearted our intentions might seem. I would give our project an 8/10 because I felt that we really created a unique experience that has the ability to change people’s perspective towards the Indigenous community. All 4 of us worked very well as we were each responsible for a certain section and we had no problems making time to work on the project as a team although Sharleen, specifically, did an awesome job taking hold of leadership. After looking through several resumes for inspiration, I decided on a simple to go for a look that was very different from my previous resume. I chose a style where the emphasis could be placed on typography. The bold title is the typeface, Womby while the body text is Montserrat. I chose these 2 sans serif fonts because I wanted something modern. My resume was targeted toward the design agency, Burnkit. Burnkit is a modern and experimental company and I tried to mimic their designs a bit in my resume. I would give myself an 8.5/10 because I believe I created a good type hierarchy. The first words to read are the coloured titles which overlap a bit of the body text to make it more interesting but are still readable. The next type to stand out are the important dates and important information. The smallest printed type are descriptions. Because of this structure, I feel like the resume flows well from top to bottom. I got the idea for my manifesto by reading several well-known design manifestos online and the ones I realized I resonated most with were focused on consumer culture. 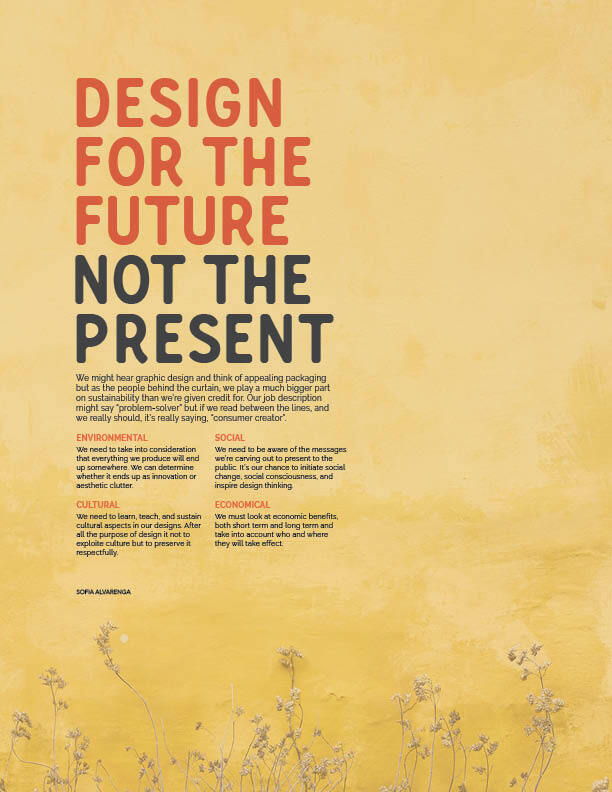 In particular, “1000 Words: A Manifesto for Sustainability in Design” by Allan Chochinov, Chochinov talks about how many things are created only to be replaced immediately. As designers, however, we have to be aware that we leave our mark on everything we create and creating only to sell a product will ultimately effect something in the future. Instead of creating for instant gratification, we should think sustainably. For my manifesto, I decided to stick to an uncomplicated design to focus more on the copy. The background, however, I chose a photograph because after playing around with background colours, I decided I wanted some texture but nothing too overwhelming. Because of the flowers on the bottom of the image, I felt that this photo tied in well with the context of preservation. I originally went with a serif font but decided to switch it to a sans serif because as others mentioned, the serif felt more outdated. I also chose orange in the text to keep the poster warmer toned and separate from the second part of the title (“Not the present”). I would give myself 7/10 because I feel like I could have done a bit more if I had added illustrations or played around with other textures. However, I was experimenting a bit with this poster so I don’t regret my decisions completely.